There’s something for everyone, including lots of free samples of goods and services, plus an emphasis on recycling at this year’s industrial exhibition. The 30th Annual Okinawa Industrial Festival runs Oct. 27 to 29, a week from now Friday through Sunday in downtown Naha, at the city’s sprawling Onoyama Park complex. Within the park, exhibits will be staged at the martial arts Okinawa Prefecture Budoukan, around the fountain, along the river, near by the various athletic venues, and along winding paths. 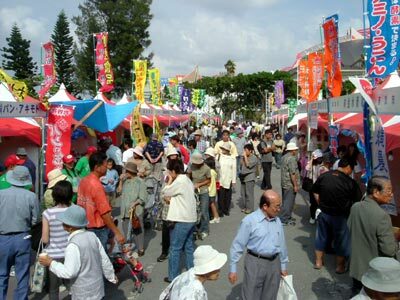 Organizers are expecting more than 200,000 visitors during the three-day exhibition, which showcases hundreds of Okinawa products producers will intrigue potential customers and motivate them to make purchases. Officials say Okinawa products are gaining influence outside the prefecture, and they seek to further promote the island goods across more of Asia. Declining space in local landfills, including Kurashiki, has led organizers to increase emphasis on the need for recycling. There will be venues dedicated to recycling, and products derived for sale as a result of recycling, plus housing and special displays from four dozen cities, towns and villages within the prefecture. More than a dozen major venues have been set up again this year, plus an Orion Beer Festival stage. Visitors can expect foods, plants, juices, and more at the Agriculture and Forestry Production area. 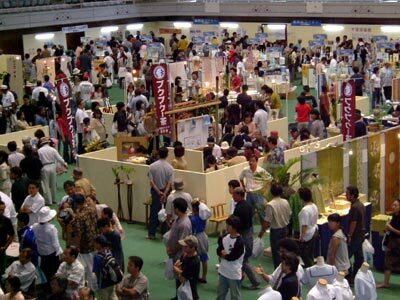 An Okinawa Electronics Exhibition runs in one of the halls, along with prefecture production materials and products. A separate natural stone materials exhibit will accent the island’s construction materials. There will be exhibits and booths dedicated to local potteries, glassware and Ryukyu glass, textiles and ceramics, bingata and minsa fabrics, shiisaa and more. Other vendors will feature Kariyushi wear fashions, with products available for purchase on site. Onoyama Park is located on the southside of downtown Naha, across from Naha Port and Naha Military Port. Travel south on Highway 58 from the military bases. As you approach the river, Onoyama Park is on the left. 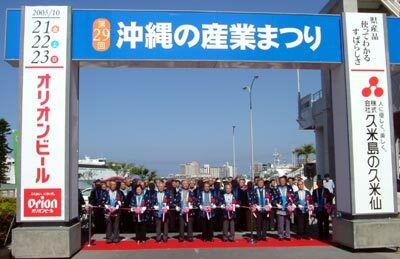 Free parking is available at Naha Military Port; look for traffic guides. Shuttle busses will transport visitors to the festival every 15~20 minutes between 9am and 9pm.